What you teach and feed the brain will continue to remain throughout their life. A baby's brain unlike ours is learning each day, processing information, liking and disliking things, and developing habits and interests. It becomes crucial in this phase (2-3 years) to introduce such things and habits which you dreamt of. Else how can the new human being become a step better than us? A long list of dos-don'ts never work for babies. 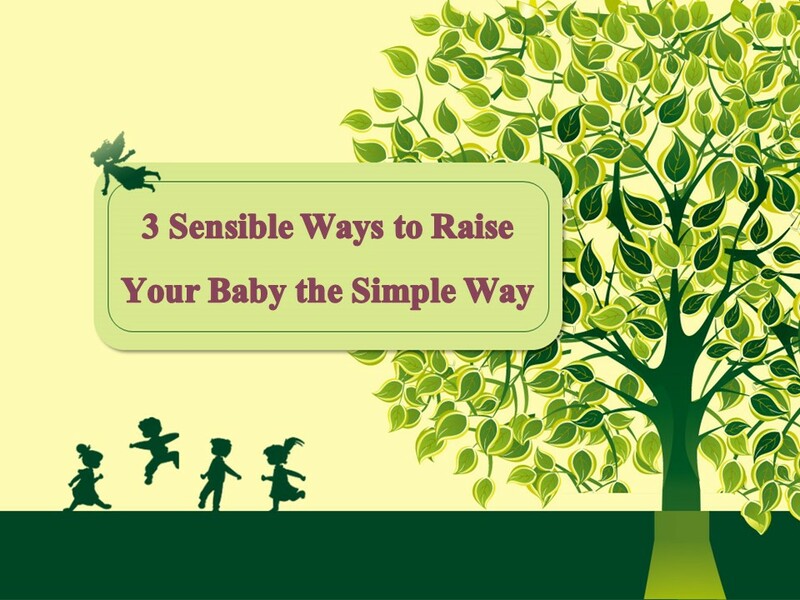 So, I am listing my "3 Sensible Ways to Raise Your Baby the Simple Way"
Expensive is Not Equal to Best - there is no point in complaining when your child is 10 years old and cries in the mall for not buying him/her the latest toy on the shelf. Or throws tantrums in front of all strangers for not giving him/her pizza. The habit your child developed was done by you. In the baby stage itself, do not be tempted to buy the most expensive thing and thinking that your baby is priceless and only deserves the best. Observe and offer what attracts them and mostly it will turn out to be common household items. I learnt this step through my baby itself and it was not intentional. My 9 month Daisy is fascinated by things like plastic bag, tube of cream, pot of lip balm, small bottles, and so on more than a bright and beautiful soft toy or ball gifted by relatives and friends. I have tried keeping both toy and household items in front of her and she invariably moves towards exploring the contours of the box or biscuit packet. And "yes" she is always under my supervision when playing with those items and "no" she doesn't have the habit of putting things in her mouth. Take Babies to Grocery Stores and Vegetable Market - Malls have taken over the markets and we are always tempted to enter the grand malls with our babies. However, the more luxury you present to them babies will learn that this is the real way of life - full of brands, glittery stores and fast food. While you cannot and should not omit going to malls, do not stop yourself from making the baby visit local shops, vegetable markets and grocery shopping. This will teach them the difference between everyday food and essentials and luxury items. Taking them to such shops will encourage your child to take interest in everyday food and understand that fast-food is okay but it is not real food. When Daisy comes with me to shopping she loves to see the red tomatoes, apples, green spinach, brown potatoes and what not. And then when I begin to cook with them she recalls her trip to market and with enthusiasm sees me cooking with them. The final verdict comes when she effortlessly eats all that I cooked in front of her. Feed the Baby Mom-Cooked Food - markets nowadays have scores of baby food in variety of flavours and for all stages of baby development. However, a sane advise is to cook food at home. Not only they will be fresh, you will have the actual knowledge of the ingredients that went into it, and the food will be very cost-effective. Babies just like us love simple fresh food. It is the habit of store brought food that we inculcate in babies, and when we cook at home and serve, babies reject it. Therefore, do not begin semi-solids and solids with store brought or packaged food and manipulate with baby's taste buds. Every product will mention it is nutritious and safe. But the fact that the item has been lying in room temperature for days and months gives me a very stale feeling. Imagine keeping a bowl of soup in the morning on the table and smelling it at night. It doesn't feel fresh and best for dispose. Real food decomposes. Factory made packaged food doesn't decompose simply because it is NOT REAL FOOD. Hope my 3 simple and sensible tips have been able to guide your parenting style in some way.